We have been on a role lately talking about neurological issues and how to go about correcting dysfunction. But not often do we have the opportunity to have a TEDx speaker come on to talk about their approach to integrative psychiatry! McCall McPherson has a wealth of knowledge when it comes to mental health from a physiological and biochemical perspective. She takes the time to actually listen to what her patients need, and uses this type of practice to discover the root cause for the mental health. Granted, she isn't just extremely knowledgeable in the mental health realm, she is also great at discovering thyroid issues, which is why she will be opening her thyroid clinic in the upcoming few weeks. 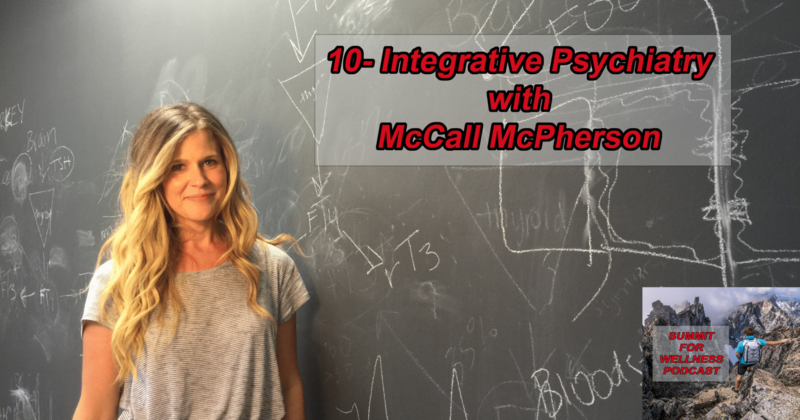 You can listen in as we pick her brain in this episode of Integrative Psychiatry with McCall McPherson! 48:00 – Why do so many people show the mutation for methylation? Thank you for listening to this episode of the Summit For Wellness Podcast. If you enjoyed Integrative Psychiatry with McCall McPherson, then subscribe to our channel so you can listen to all the latest episodes.